With Summer here and outdoor garden activities at its highest, there are many people on the lookout for the best garden shed to add to their home. If you are in the market for a shed or looking to upgrade an old one then you are in luck! I have pulled together ourTop 10 Best Selling Garden Sheds from 2018, these are the sheds and workshops that hundreds of Australians have invested in last year. So if you want to know more about what other Aussies are adding to their backyards this summer check out our best sellers list below. The Cheap Sheds Garden Shed may not look impressive… but this model is often in the top 5 of our best seller list. So what makes this shed so popular? People are looking for extra storage but do not want to lose any space in their yards. This Cheap Sheds design is narrow but wide which means it can be fitted neatly up against a wall or be tucked under the eaves of your home. It is also big enough to fit all those essential outdoor tools and bikes. And with its low price, it meets not only many different needs but also budgets. Popular Features: Double doors, easy to assemble with the Fasttrak system, comes in 3 great colours and has a rock bottom price tag! The Slimline F36 YardSaver has made it to #2 in 2018. It has single side door access to so you can tuck it away down narrow areas. The flat roof gives you extra storage on top and helpful to fit under eaves. It provides ample storage space with its length. You can store your gardening tools, whipper snipper or even your lawn mower all in this unit! Popular features: Slim fit for small backyards, affordable price tag, comes in 3 colour choices, double doors. 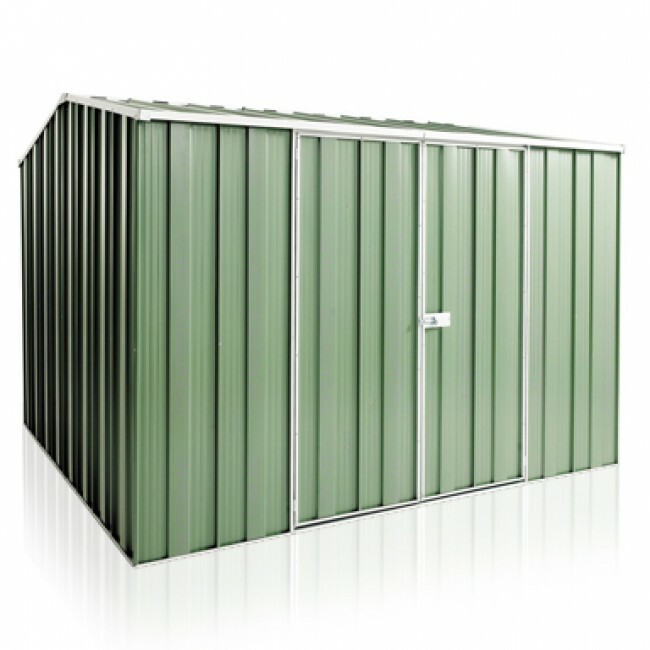 This YardSaver 3.15m x 2.8, Garden Shed is considered to be the typical backyard Aussie Garden Shed. It is a freestanding large garden shed which is large enough to fit your gardening equipment and tool. You could even use it to store your outdoor entertainment accessories, bikes or camping gear! It gives you all the storage space you need plus fits comfortably in most backyards. The wide door provides easy access and Gable roof gives you a little more headspace, which is highly sought after in the market today. Popular features: Gabel roof, large hinged double doors, comes in 3 colours. 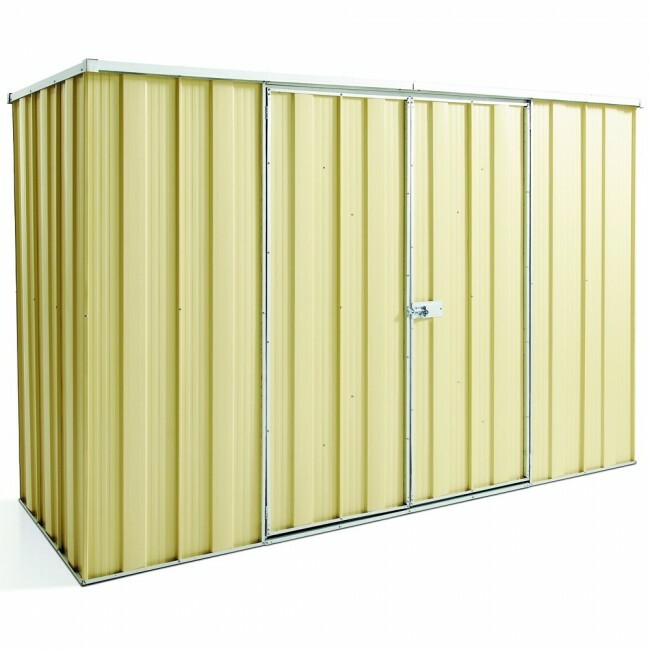 At number 4 of our “Best Sellers” list is a Spanbilt Storemate 1.76m x 1.07m x 1.265m Storage Unit. This is also often at the top of our list and it’s easy to see why! It has a versatile design where it opens from the front and the top. It has a wide opening door for easy access and not very tall so it fits in most places. You can store bins and bikes and all sorts in this shed. The roof access makes it easy to get things in and out and gives you easy access. It assembles using the Fasttrak assembly system making DIY quick and simple. We also have the popular Absco Bike Shed which was a top seller right through 2018 as soon as it was launched. It has stayed on our best seller list ever since. Outdoor enthusiasts who need room for their adventure gear. This Cheap Sheds Large Workshop 5.9m x 2.8m is a great workshop at a competitive price. This is our best selling workshop out of a few hundred so the customers have spoken! It is a freestanding large workshop with both a double door and single door access. It comes in 3 popular colours is made right here in Brisbane at our headquarters. The double door access is wide and provides easy access. The gable roof gives you a little more headspace, which is highly sought after in the market today. Not quite a shed but a super popular garden storage solution, the Keter High Store is flying out the door. It is a large storage cabinet which fits neatly in or around the home. It’s made of strong UV protected plastic which means it won’t peel or fade and the easiest sheds to assemble due to their light weight and snap together system. They are also strong enough that they meet the Australians building standards. Popular features: Attractive colour combination, lightweight and fast to assemble, versatile use and maintenance free. Another narrow Shed made it on our 2018 ‘Best Sellers’ list. It is the EasyShed flat roof 2.25m x 0.78m Shed. This EasyShed is a great narrow storage option and can fit neatly around the home, against walls and fences. The flat roof can fit under most homes eaves and double up as a shelf for long items needing somewhere to be stored. Popular features: Affordable price, 24 different colour options. The EasyShed range provides the biggest range of workshops with optional customisation and accessories on the market. This size is currently proving to be popular for many homeowners with slate grey being the colour of the month! Popular features: Large double hinged door and side door access, 24 colours to choose from, gable roof and lots of accessories to choose from. Okay here’s another one of our popular Cheap Sheds Brand Garden Sheds. 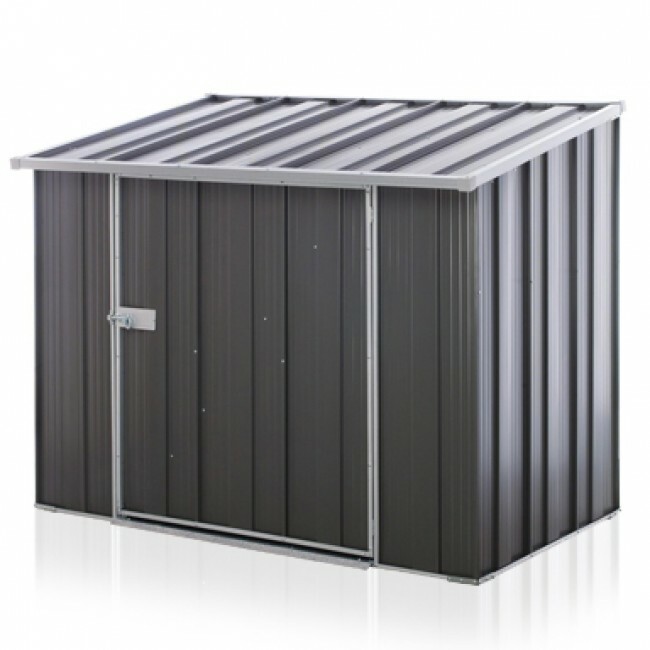 The Cheap Sheds 2.45m x 2.8m Garden Shed is much like its brother models, it is just that great combination of an affordable price tag, top quality and style, which makes them popular. Every yard needs a garden shed and with a 2.1m x 2.1m dimensions, this one still fits in the average garden and will provide you great storage space for gardening equipment, your bikes and perhaps some seasonal household items. So clear out your house of unwanted items and clean up your yard by adding our, fast selling, Cheap Sheds Medium Garden Shed. Popular features: Large hinged door, 3 colours to choose from, gable roof and an affordable price tag for a medium shed! That’s our top 10 Best selling garden sheds of 2018 but before I leave you, do you want another hot tip? The best selling colours are Slate Grey and Monument Grey, followed by Rivergum and Mist Green. Hi – You have a really impressive range of sheds. I especially like the narrow sheds that almost everybody could find room for in their outside space. Garden sheds are usually made of wood and whilst they might look nice they require some maintaining. Your sheds look simple to put up and very durable. Thanks for the comment Ruth! We are pretty proud of our range. Our Narrow Sheds are particularly popular 🙂 Its probably due to the fact that many people live in smaller dwellings, not just in suburbia these days and they too need some neat storage solutions for their homes. And these just fit in anywhere. These days Timber Sheds are almost as easy to take care of as Steel Sheds, you just have to make sure you buy the right brand! You get some really good DIY Timber sheds- we have some beautiful sheds in our range. They are my favourite when it comes to ‘Looks’ but they are an acquired taste where as our Steel sheds are our best sellers thanks to price.